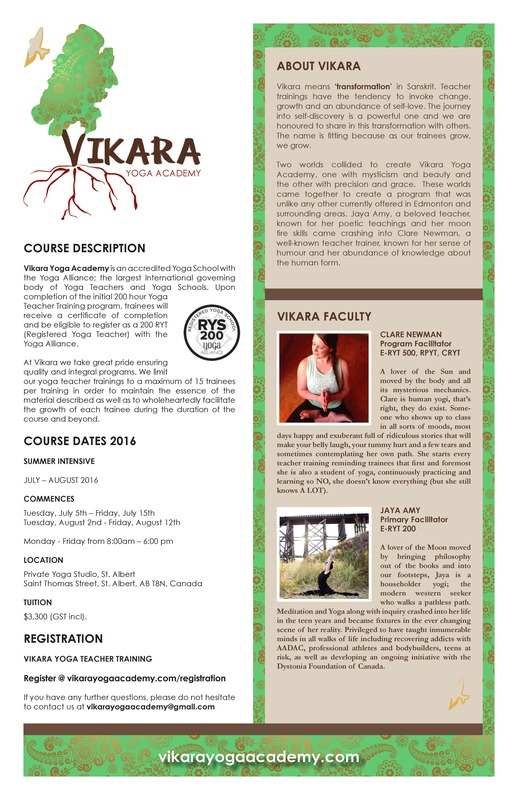 Imagine spending 4 weeks this summer immersing yourself in the whole practice of Yoga! Yoga immersion trainings tend to be well, intense. Immersed in the study, philosophy and esoteric practices of yoga, we’ve designed a program over the summer that will allow students to discover and learn the teachings of yoga without being completely overwhelmed. This 200 hr, Yoga Alliance accredited program will be taught over two full weeks in July and August, allowing students to immerse themselves but also encouraging introspection with time to rest and absorb the many teachings with a two week break in-between. We take great pride in 200 hr Yoga Teacher Training program at Vikara Yoga because of it’s uniqueness and varied teachings. Graduates will become knowledgeable in all ‘styles’ of yoga with the ability to teach varied classes from Hatha, Restorative, Vinyasa Flow, Yoga Nidra, Pre & Postnatal Yoga and Kid’s to much much more! Many people enrol in this program to deepen their personal practice with no desire to teach but rather use the teachings of yoga to navigate through life. In order to foster growth and continue our focus on our mentorship program after the training, we limit out trainings to 15 people! This training is already filling up so don’t delay! 200 hr Yoga Teacher Training Scholarship!